Dave Ulrich is the HR guru's guru, credited with developing the "HR business partner" model and other influential ideas in books including "HR Champions" and "The HR Value Proposition". Here, Ulrich explains the six competencies HR must develop to tackle the challenges of the worldwide economic crisis, globalisation, technological innovations and other changes. He is talking about these issues at HR Performance conference on 21 November. It is often easier to look back to what has been than forward to what might be. HR has a rich history, but an even more exciting future. In the past half-century or so, the HR profession has been through three general waves (see figure 1) and a fourth is emerging. Each wave follows a similar curve through time with start-up, learning, growth, and then stability. Wave one emphasised the administrative work of HR, where HR personnel focused on terms and conditions of work, delivery of HR services and regulatory compliance. HR was predominantly what we would describe as an "administrative and transactional utility". Wave one HR roles tended to be filled with people who did an excellent job of administration. The transaction and administrative work of HR continues today, but it is done differently through outsourcing and technology solutions. Wave two emphasizes the design of innovative HR practices in sourcing, compensation or rewards, learning, communication and so forth. Innovations have occurred in rewards, communication, training, recruiting, succession planning and other HR practice areas. While each of these HR practice areas innovated in terms of what and how it was done, they also were integrated with each other to provide a consistent approach to HR. 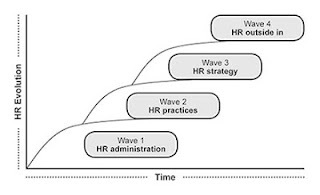 Wave three has focused on the connection of individual and integrated HR practices to business success through strategic HR. For the last 15 to 20 years, HR has worked to link its work to the strategy or purposes of a business. This work has expanded HR practices from a primary focus on talent to include contribution to culture and leadership. Given a business's strategy, HR professionals would be charged with assessing and improving talent, culture, and leadership to accomplish the strategy. In this wave, HR professionals turned strategies into HR priorities to deliver on strategic promises. The worldwide economic crisis, globalization, technological innovations, and other changes in recent years have challenged the future of HR. Some HR leaders want to look back and reinforce HR administrative work by doing basics well and others want to return to focusing on targeted HR practices. I would rather look forward to a new normal for HR. Wave four uses HR practices to derive and respond to external business conditions, called "HR from the outside in". Outside-in HR goes beyond strategy to align its work with business contexts and stakeholders. 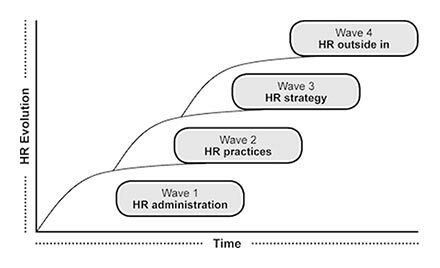 The three earlier waves represent HR work that still has to be done well: HR administration must be flawless; HR practices must be innovative and integrated; and HR must turn strategic aspirations into HR actions. But rather than rely on these waves, future-facing HR professionals should look outside their organisations to customers, investors, and communities to define successful HR. For HR to deliver the standards of the first three waves and the promises of the fourth (outside-in), our research shows that HR professionals must master six competencies. These competencies are based on research from more than 20,000 respondents around the world. These 20,000 respondents (HR professionals and their line and HR associates) completed assessments of HR competence on 140 behavioral and knowledge items. These six competencies are represented in figure 2, and are described below. 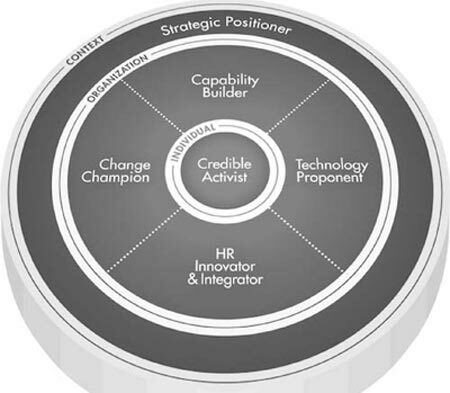 HR professionals in high-performing firms function as credible activists. They do what they say thay will do. Such results-based integrity serves as the foundation of personal trust that, in turn, translates into professional credibility. They have effective interpersonal skills. They are flexible in developing positive chemistry with key stakeholders. They translate this positive chemistry into influence that contributes to business results. They take strong positions about business issues that are grounded in sound data and thoughtful opinions. High-performing HR professionals understand the global business context - the social, political, economic, environmental, technological, and demographic trends that bear on their business - and translate these trends into business implications. They understand the structure and logic of their own industries and the underlying competitive dynamics of the markets they serve, including customer, competitor, and supplier trends. They then apply this knowledge in developing a personal vision for the future of their own company. They participate in developing customer-focused business strategies and in translating the business strategy into annual business plans and goals. At the organisational level, an effective HR professional creates, audits, and orchestrates an effective and strong organisation by helping define and build its organisational capabilities. Capability represents what the organisation is good at and known for. These capabilities outlast the behavior or performance of any individual manager or system. Such capabilities might include innovation, speed, customer focus, efficiency, and the creation of meaning and purpose at work. HR professionals can help line managers create meaning so that the capability of the organisation reflects the deeper values of the employees. Effective HR professionals develop their organisations' capacity for change and then translate that capacity into effective change processes and structures. They ensure a seamless integration of change processes that builds sustainable competitive advantage. They build the case for change based on market and business reality, and they overcome resistance to change by engaging key stakeholders in key decisions and building their commitment to full implementation. They sustain change by ensuring the availability of necessary resources including time, people, capital, and information, and by capturing the lessons of both success and failure. At an organisational level, a major competency of effective HR professionals is their ability to innovate and integrate HR practices around a few critical business issues. The challenge is to make the HR whole more effective than the sum of its parts. High-performing HR professionals ensure that desired business results are clearly and precisely prioritised, that the necessary organisation capabilities are powerfully conceptualised and operationalised, and that the appropriate HR practices, processes, structures, and procedures are aligned to create and sustain the identified organisational capabilities. As they do so with discipline and consistency, they help collective HR practices to reach the tipping point of impact on business results. The innovation and integration of HR practices, processes, and structures, directs HR more fully toward impacting business results. For many years, HR professionals have applied technology to basic HR work. HR information systems (HRIS) have been applied to enhance the efficiency of HR processes including benefits, payroll processing, health care funding, record keeping, and other administrative services. In this HRIS round, we see a dramatic change in the implications of technology for HR professionals. At the organisation level, high-performing HR professionals are now involved in two additional categories of technological application. First, HR professionals are applying social networking technology to help people stay connected with each other. They help guide the connectedness of people within the firm and the connectedness between people outside firms (especially customers) with employees inside the firm. Second, in the high-performing firms, HR professionals are increasing their role in the management of information. This includes identifying the information that should receive focus, bundling that information into useable knowledge, leveraging that knowledge into key decisions, and then ensuring that these decision are clearly communicated and acted upon. This updates the operational efficiency competency and will add substantive value to their organizations. It is a great time to be in HR because the future holds not only a promise, but a pathway to business impact. As HR professionals master these six competencies, they will not only be seen as more effective HR professionals, they will add explicit value to their business. Our research shows that being a credible activist helps HR professionals gain personal credibility, but being capability builders, HR innovators and integrators and technology proponents have more impact on business performance. Dave Ulrich is professor, Ross School of Business, University of Michigan Partner, The RBL Group. His latest book is HR transformation - six competencies for the future of human resources, published by McGraw Hill Professional in 2012.